I’ve never characterized Thanksgiving as just “a day to be thankful” – it’s always been more about a day of good food, parades and family because I just don’t understand limiting thankfulness to one day. A thing as difficult as say parades, however, I do understand limiting. The loss of life and terror we saw this past weekend was a reminder of those things we should never forget to be thankful for – not even for one day…and it reminded us of the evil facets of mankind that, as one president so eloquently stated, must be smoked out. And so, this Thanksgiving my family gathered in Brooklyn, taking breaks from CNN and attempting to celebrate the holiday albeit with heavy hearts, guilty over our good fortune of being here and not there. This year we invited R’s North Indian family and my South Indian family, which isn’t so so South Indian since it now includes my Gujurati brother-in-law and sister-in-law, to Brooklyn. Our menu ended up being a little North, a little South, a little Guju and a teeny bit Brooklyn. People always wonder what a vegetarian, desi family eats for Thanksgiving. I can’t fault their curiosity. Truth be told, we’re not exactly sure WHAT we’re supposed to eat either. Tofurkey gets no love in our house – it’s too bready, dry and bland. Some years we’ve just had a normal dinner, which is slightly less than festive. Without a real tradition and no official guidance about what should grace our dinner table, we tend to overload on our favorite desi foods. Not such a bad alternative. To start off the evening, R made bhel puri using Swad brand chaat in a box. 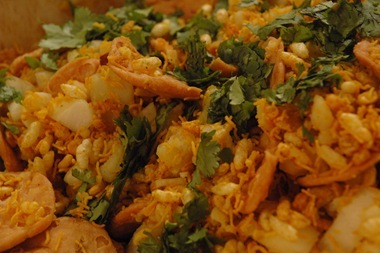 Chaat, (pronounced like “chaaat” rhymes with “rot”) an Indian “roadside” snack, is a mixture of crunchy and soft, sweet, tangy tamarind chutney, spicy green chili and garlic chutneys all coated with a variety of masalas – amchoor, lal mirch, coriander and cumin (the picture above is pre-chutney). Swad’s chaat kit is surprisingly good and not just good as in “good for chaat out of a box” or “good for $2.99 a box.” It’s good good. The puffed rice, sev and puris are always crunchy and fresh tasting, you can add as little or much chutney as you want it spicy and you simply add chopped boiled potatoes, diced onions and fresh cilantro. Plus, everything comes in these shiny gold and silver foil bags that look very Willy Wonka-ish. R made this about an hour before family arrived and then added the chutneys right before we expected everyone. 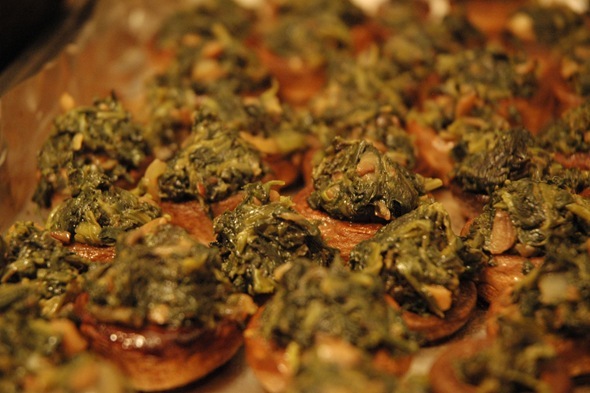 We also made stuffed mushrooms, which don’t fit into a north-south-guju-brooklyn menu but taste really good. R’s aunty makes these for turkey day in Chatham, NJ and they’re always a hit. So we went with it. There were certain culprits in the kitchen sneaking mushrooms before it was officially time to dig in. These are simple to make – remove and set aside the stems from large, white mushrooms. * Preheat the oven to 350 degrees. Pour about 2 tbspn. olive oil into a large mixing bowl and sprinkle in ~1/2 tspn. sea salt and a 1/4 tspn. lal mirch. 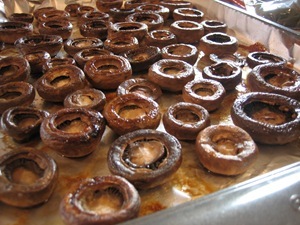 Toss the mushroom caps into the mixing bowl and use your hands to toss them around until well coated. You can cover the mixing bowl with a plate and shake it good too. Spread the caps, cavity side down, on a cookie tray covered in aluminum foil and bake on the lower rack until liquid runs off from the caps and dries up and the caps are well browned (see picture where I turned the caps cavity side up after baking). Meanwhile, saute half a diced onion until translucent along with 3 cloves diced garlic. Dice half of the mushroom stems and add to the onion/garlic mixture cooking until browned. Add 1 1/2 packages frozen, chopped spinach and cook covered on medium-heat for about 10-12 minutes. Add 1/2 cup of grated parmesan cheese and cook uncovered for about 5 more minutes. After it cools, spoon the mix into the mushroom cavities. Top each mushroom with a sprinkle of parmesan. Bake again on 350 degrees on the lower rack until the cheese on top melts or for about 8-10 minutes. Serve hot. 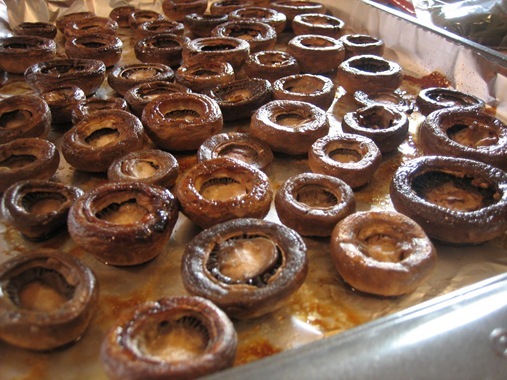 *To destem the mushrooms, hold the cap in your left palm and gently twist the stem up and out with your right hand. You can use a small teaspoon if the base of the stem gets stuck too. The North Indian half of our dinner included mattar paneer, shahi aloo gobi and dhal makhani (courtesy of R’s mom from NJ). My brother made Gujurati style kadhi with stuffed patra, a real treat since patra (taro root leaves) is considered a delicacy that’s hard to find and harder to cook. We also catered a few South Indian dishes from the canteen at the Ganesh Temple in Flushing. The temple’s canteen is usually some of the best South Indian food available in NY. Everything we’ve ever eaten there has been mouth watering, finger licking goodness. I’m not sure if they had the B-team chefs cooking on Thanksgiving or what but the catered food wasn’t very impressive. 1. Preheat the Griddler to high. Quarter the block of paneer so you have four square pieces. 2. Spray each side of the griddle with olive oil cooking spray. Place the paneer on the griddle, close and grill until the paneer is golden on both sides being careful not to let it burn. Allow the paneer to cool, then cut it into bite size pieces. You could try a hot skillet if you don’t own a Griddler. 3. Bring a pot of water with a 1/4-1/2 tspn. turmeric to a boil. Drop in the paneer and let it boil for ~ 15 minutes. This little secret softens the paneer and makes it chewy (MIL tip which R will probably hate that I gave away!). For dessert, we treated ourselves to a fresh ginger pumpkin pie and a pecan pie from Sweet Melissa Patisserie on 7th Ave in Park Slope. I’m not up to date on the price of pie nowadays, but I’m pretty sure Sweet Melissa’s is on the pricey side. It’s locally owned though and was able to verify a few minutes shy of our allotted pickup time that they only used vegetable shortening (in all of the planning, I totally forgot to ask about animal shortening until the day of!) – not to mention the pies were delicios-o (pronounced “dee-lish-eee-ooo-soo” – my neices, M&M, word for delicious which I think they learned from Dora). Keep an eye out for my shahi aloo gobi recipe and for my brother’s Gujurati kadhi with patra (who was so kind as to take some of the pictures above while I slaving away over the stove!). I love reading your blog and have learned a few recipes too. We definitely missed the Thanksgiving Dinner, but got a taste of it reading the above. 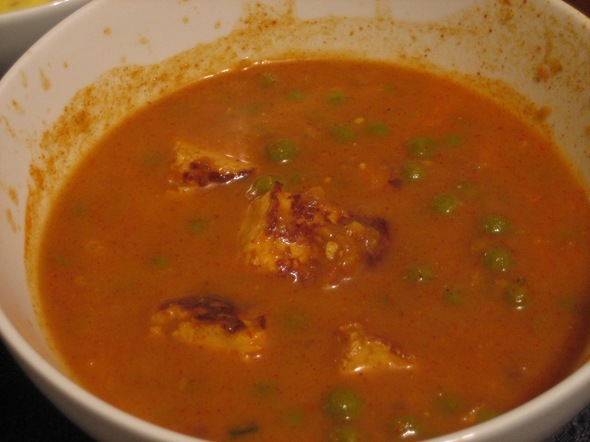 A suggestion for Shahi Paneer , try substituting cream with lof fat sour cream. I use this all the time and it thickens the gravy without the added fat.